Mitel 5224 - plugs into adapted headset port and power port. Side control unit features conference unit on / off, volume controls, presentation mode and mute. For Mitel 5235, 5324, 5330, 5340, and 5360 models - plugs into and requires the 5310 IP Conference Module (sold separately). Conference controller application on the phones features softkey functionality for conference unit on / off, volume controls, presentation mode and mute. The Mitel 5310 IP Conference Module allows the Mitel 5310 Conference Unit to be added to the 5235, 5324, 5330, 5340, and 5360 IP Phone models. The Conference Module is shown here added to the right side of a Mitel IP phone, and is interfaced with a 5310 IP Conference Unit. The 5310 IP Conference Unit (shown here in white on the far right) plugs directly into the module, which is shown by itself below. 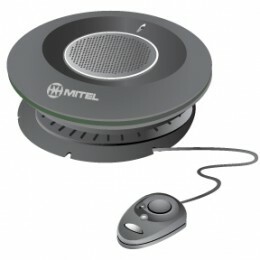 Please note: The 5310 IP Conference Module is sold on it's own (seen to the right) and does NOT come with a compatible Mitel IP phone or the Mitel 5310 IP Conference Unit. When purchasing the 5310 IP Conference Module, please ensure that you already have (or purchase separately) a compatible Mitel IP phone and the 5310 IP Conference Unit. Every Mitel 5310 IP Conference Unit / Module from Telephone Magic comes with a full 1-year warranty.